Take a look behind the scenes at Karl Lagerfeld's latest haute couture collection for Chanel in Paris, with Kristen Stewart, Tilda Swinton, Julianne Moore and Pharell Williams. We also see the Chanel atelier and the exquisite workmanship that creates this iconic fashion house's couture collections, writes Jeanne-Marie Cilento. Creative director of Chanel, Karl Lagerfeld, talks about why Paris is best known for high fashion and how the Eiffel Tower is the monument that best symbolises his new Autumn Winter 2017/18 haute couture show. Beneath the soaring glass dome of the Grand Palais, Chanel created a 38-meter high version of the tower, with wooden garden chairs set out beneath like a Parisian park, a runway designed to invite a leisurely stroll and a rediscovery of the city, writes Jeanne-Marie Cilento. One of the highlights of the packed calendar at this year's Cannes Film Festival was the star studded benefit hosted by the Hollywood Foreign Press Association for the International Rescue Committee. The throng of actors included Tilda Swinton, Jake Gyllenhaal, Dustin Hoffman, Ben Stiller, Emma Thompson and Lily Collins, Jeanne-Marie Cilento & Antonio Della Rovere report. A short film produced by DAM television and filmed in Brussels by Elli Ioannou at the city's art museums including Bozar, Centre for Fine Arts, the Boghossian Foundation at Villa Empain and the Vanhaerents Collection. Artists include Pol Bury, Maarten Vanden Eynd, JameLee Byers and Tomas Saraceno. Watch an interview with karl Lagerfeld and the entire show from start to finish. 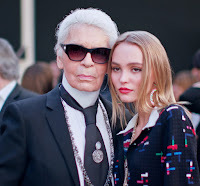 Interview with Karl Lagerfeld, the creative director of Chanel, talking about his soigne new haute couture collection in Paris under the great, glass dome of the Grand Palais and a look backstage at the preparation before the show, by Jeanne-Marie Cilento. Each season Karl Lagerfeld creates Chanel collections that seduce and polarise new generations of the jeunesse dorée. His latest work, shown in Paris earlier this month, for Spring/Summer 2017 was set in a digital world with two cyborgs opening the show, both a commentary on society's obsession with new technology, followed by a brilliant yet wearable collection that seemed both contemporary and retro with a dash of Eighties futurism. Australian designer Brodie Neill talks to Jeanne-Marie Cilento about his stellar international career. Based in London, he discusses his new work and inspiration ~ including the influence of listening to Swedish House music on his creative oeuvre in our DAM TV interview. Australian filmmaker and photojournalist David Adam’s exciting television series Alexander’s Lost World is being broadcast on networks around the world. Jeanne-Marie Cilento interviewed the inveterate traveller about his adventures at his beautiful mud-brick home overlooking the Bilgola Plateau in Sydney. The Dutch rockstar of the design world, the tall, leonine Marcel Wanders talks to Jeanne-Marie Cilento in Milan, Italy about his philosophy and his work, now held in museum collections around the world, and his signature necklace of meteorite, lava, birthstones and Baccarat crystals. 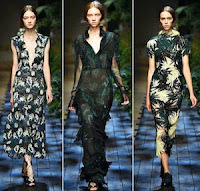 highlights from the catwalk shows from Day Four at London Fashion Week Spring/Summer 2015. There are interviews with Laura Bailey, Paula Reed & Naomi Harris. Look out for our upcoming report of all the best looks and trends from our fashion correspondent Limor Helfgott.